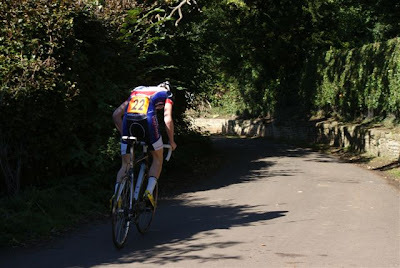 Club records were under serious threat in the 2012 club hill climb championship as Kyle and Jess Watts each went within 1 second of the men's and ladies club records for the course. Fantastic weather conditions - sunny, warm, and a light westerly breeze - lead to a string of fast times being set. Second rider to start, Michael Jones, recorded a scorching time of 2:42.5 to set a tough mark for the following riders. Adam Hogarth was the early leader in the club championship, dipping under 3 minutes and holding that position for 15 minutes until Tim Wilcock crossed the line in 2:53.1. Kyle, starting last, finished just 0.8 seconds slower than the club record with 2:38.8, the fastest time seen on the hill for many years. Ritchie Case was fastest Veteran. The Ladies competition produced an even closer miss as Jess Watts finished just 0.1 second off Elaine Dey's record which has stood since 1990, with Karen Colleran 2nd.